This paper explores ideas about the significance of practitioners’ living professional portfolios as explanatory accounts of practice as those practitioners seek to explain how they hold themselves accountable for what they are doing. Their portfolios come to act as explanatory frameworks for their lives in education, as they ask, ‘How do I improve my practice?’ (Whitehead 1989). The significance of living portfolios lies in the capacity of all practitioners to show how they have the potential to influence the education of social formations for cultural transformation. The realisation of this potential can be achieved by, first, demonstrating the validity of their claims to know what they are doing through the production of an empirically verifiable evidence base that can be tested against the critical scrutiny of others; second, engaging seriously in debates about the forms of research, and their forms of representation, that are most relevant to issues of professional education, within a context of an appreciation of the problematic of competing rights claims in relation to methodological approaches. This latter point is of especial significance in current debates about the epistemological distinctions between ‘education research’ and ‘educational research’, and the political implications for the form of research that most appropriately acts as the basis of professional education across the professions. My work is located within the burgeoning field of living theory, a field that is grounded in self-study action research. Living theory is distinct from other forms of theory, such as propositional theory: propositional theory offers conceptual explanations of practice in the form of linguistic abstractions, whose validity is demonstrated through the way in which sentences formally relate to one another; while living theory offers living explanations for practice in the form of the descriptions and explanations that practitioners produce to show the validity of their lives in action. These often take the form of multimedia representations and visual narratives that show the lived reality of lives in action (Whitehead 2004). Living theory may be located within the same realm of discourse as educational research, as distinct from education research. The distinction between the two forms was clearly articulated by Whitty (2005) when he identified education research as distinguishing the whole field of research in education, while educational research focused on demonstrating the educational nature of research for the researcher and other participants for purposes of improvement of policy and practice. I locate my work within the field of educational research for improving policy and practice through the generation of living educational theories. A key aspect of living educational theories is that the ‘I’ is the centre of the enquiry, and offers an account, which includes a testable evidence base together with articulated criteria and standards of judgement, that shows how practitioners are trying to improve their practice. Because I commit to the idea that each one of us needs to show how and why we can validly claim that we are improving our practice, I begin with myself. This approach is also informed by my belief that no one should expect another to do something which they are not prepared first to do themselves. So this paper becomes my explanatory account for my life in education, in the hope that my story may influence others also to engage in educational research, and to show the significance of their work for wider adoption in cultural transformation. In the compilation of portfolios, practitioners often ask, ‘Where do I begin?’ I ask myself the same question. I take as my starting point the time when I began my doctoral studies in 1981, and began to appreciate my capacity for questioning the normative assumptions of my personal and professional habitus (Bourdieu 1990), and learning how to think for myself. My period of enlightenment spanned the same time as the Berlin Wall, which was raised in 1961, the year after I first went to University and began dimly to perceive the stultifying influences of normative epistemologies, and fell in 1989, the year of the completion of my doctoral studies, when I received academic legitimation, through the award of my PhD, of myself as a critically dynamic thinker. This experience of learning how to become a critical thinker was painful, yet I now see that it has to be a precondition for educational action, which is premised on the idea that all can and should think for themselves in the formation of a sustainable open society (Popper 1962). I can clearly distinguish two phases of my life: pre-1981, when I spoke other people’s scripts, like a ventriloquist’s doll; and post-1981, when I began to see the need to demonstrate my moral accountability for my work, and began to exercise my social and educational agency. My personal transformation is distinguished by a shift from a commitment to a linear form of logic that moved from A –> B –> C –> n, with the intent of achieving closure and final solutions, to a commitment to dynamic and relational forms of thinking that enabled me to understand life as a infinitely unfolding process of always-already new beginnings in the ever-present now, each containing its entire potential future within itself, to be realised through intentional action. The second phase of my life has been spent making up for lost time, inspired by a sense of gratitude, where I focus on how I can find ways of enabling other people also to come to think for themselves, and produce their accounts of practice to show how and why they are doing so. The key questions that inform my current practices are, ‘How do I improve what I am doing? How do I account for what I am doing? How do I exercise my educational influence in learning?’ My answers appear as my professional portfolio, and the entries in my portfolio are from post-1981. I begin with my first publication (McNiff 1984). In that publication I produced the diagram below. This was, and still is, a key metaphor for my conceptualisation of generative transformational evolutionary processes, the idea that enquiries can be identified as dynamic cycles of action reflection, animated by life-affirming energy (Whitehead 2008), within a broader frame of a life of enquiry. In this diagram, I indicate how a life of enquiry can be understood as the generation of new learning for educational action from previous experience (Winter 1989), and how one spin-off spiral can be integrated within an overall framework of enquiry. The diagram also communicates the idea of unfolding potential from a limited number of forms: an oak tree unfolds from an acorn, a frog from a tadpole. Life is always in emergence; even at the point of death, life emerges. I have learned this from the experience of living with others’ dying, and acting as a contributing influence in the quality of living that makes life life-affirming in the face of impending death. In my portfolio I want to trace the experiential pathway that transforms the diagram above into the picture below, which is of me (on the left) presenting her doctoral cap and hood to Mary Roche, a PhD graduand of the University of Limerick, whose masters and doctoral studies I have supported since 1995 (see Roche 2000, 2007). Tracing this pathway takes me across time and across continents, so I now set out the contexts for my work, and the nature and purposes of that work. I joined St Mary’s in 2005, on a 3-year contract, to contribute to research capacity through academic staff development. During this time I have worked with some remarkable people, including a group of staff who have focused on realising their capacity for knowledge creation through investigating their practice as university lecturers and professional educators. Six are about to complete their masters studies, and several more are engaging in doctoral studies. In turn, they have introduced the idea of personal enquiry for living theories to their groups of undergraduate and postgraduate student teachers, who are also conducting their personal enquiries into practice, and each generating their own living theory of practice. I work in two contexts in South Africa. At NMMU I work with a group of about 10 academic staff, each of who is studying their practice, and producing their scholarly publications as their living accounts of practice. Drawing on their own experience, Wood, Morar and Mostert (2007) explain how they appreciate the idea of living theories as the most adequate forms in which to communicate the educational purposes of their academic work. McNiff and Naidoo (2007) give an account of their politically oriented practices as they seek to develop inclusional epistemologies for a new scholarship of democratic educational enquiry in higher education. 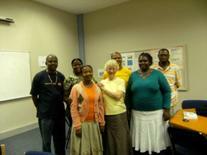 In Khayelitsha I work with twelve teachers, on the St Mary’s Professional Values and Practice masters programme. Each of the teachers investigates their potentials for educational influence as they ask questions of the kind, ‘ How do I improve my practice as a mathematics educator as I encourage my learners to become independent learners and take responsibility for their own learning? ’ (Adams 2008) and ‘How do I create a dialogical classroom through a dialectical approach?’ (Majake 2008). The production of these accounts contributes to raising awareness of the potentials of teachers’ work for organisational improvement and policy formation, as well as exercising cultural influence in organisations. I work in Iceland with several small groups, comprising one large group, of teachers and professional educators, most of whom know each other, given the small number of the population. Levels of educational commitment are exceptionally high in Iceland, and most professionals engage in prolonged periods of study as normal professional practice. A group of Icelanders in schools and higher education institutions have engaged seriously with the idea of producing their living accounts of practice to show how they account for what they are doing, and are initiating an Icelandic Educational Research Association that has the potential to influence and integrate theory, practice and policy. Because I have been working in Ireland for a long time, since 1992, I am associated with many groups, but my most important place of work is with the University of Limerick, where I have supported the doctoral enquiries of five classroom teachers since 2001. All five graduated in the years 2006 and 2007, and their completed PhD theses now form a significant knowledge base for a new epistemology of a scholarship of teaching (Schön 1995). Each thesis focused on enabling cultural transformation through educational enquiry. Again the link is made between improving practice and knowledge creation. The picture of Mary Roche and myself above shows the realisation of the potential. In that picture, the symbolism of our robes indicates that the ideas I generated in my own doctoral studies at the University of Bath (McNiff 1989) have become embedded through my educational influence within the University of Limerick at the highest level of scholarship (see also Whitehead 2008). When Mary and I first met in Cork in 1995, at the beginning of her masters studies, when I asked her what she did, her response was, ‘I’m just a teacher.’ She is now a doctor teacher, whose work demonstrates the pinnacle of academic achievement through a commitment to personal accountability. I can take each of these contexts and their different practices, and show how they are integrated within my story of a life of enquiry. I can show the relational nature of each of the stories, which tell of practices existing side by side, like the strands of a braided river, yet each communicating the flow of values-oriented practice, as aspects of the same river as it leads to and becomes integrated within the wider ocean. Occasionally some of the groups come together at conferences, but so far I have not managed to bring all together at the same time. I am working on this. Perhaps the most realistic form of communication would be a live e-list, which transforms the barriers of real time and space into living encounters. The compilation of the portfolio presented here includes brief accounts of work in each of my contexts, and these are explanatory accounts. The people in each of the contexts is able to explain how they are exercising their educational influences in learning. Most of them can show how they are achieving catalytic validity (Lather 1991) in the sense that they are influencing processes of cultural transformation with educational intent, a view that other people can come to think for themselves as they work towards the formation of their own open societies. Most of them can also show how they have exercised reflexive critique (Winter 1989), where they have come to reflect personally on their emerging insights as they critique their normative assumptions; and have also have exercised dialectical critique (ibid. ), where they have grown in appreciation of the political and cultural forces that have brought them to their current situations, and how they now have the capacity to exercise their educational agency for social betterment. These stories, each a branch of the flowing river, have emerged from, while still being related to, my own story. I can point to the stories as the living evidence of my own educational influence, as I have worked with each of the groups to come to appreciate their own potentials for improving education through knowledge creation. They have come to see their potentials for themselves. I did not make them do this, nor did I have any hand in enabling the potential to emerge. What I have done is say to people, ‘You can do this for yourselves. You have it in you.’ I have also adopted a nurturing and sometimes demanding stance, saying, ‘I expect this of you. You have an obligation to yourself and to your contexts to become more than you are, to learn how to exercise your own potential for life-affirming practices.’ The evidence base of my practice is in the people’s lives, and how they have taken up the invitation to become more than they are. My portfolio therefore is an explanation for my life in education. I observe the principles of the methodological rigour of action research (Winter 1989), when I show how I have gathered data and generated evidence to test my claims that I have enabled others to think for themselves and take control of their own lives; and I believe I am thus justified in testing my belief that I have exercised my educational influences in learning. I have used living standards as I make judgements on the quality of my own research, and show how I believe I am justified in making my claims. My portfolio is the articulation of my claim, a living document that, although existing here on paper, is embodied in the lives of people as they ask, ‘How do I~we improve my practice?’, where ‘~’ communicates the idea that ‘I’ can transform into ‘we’ in contexts of intentional collective communicative action for social evolution. What happens in the social contexts where I work is true and is the judge of the validity of any theory about it. The truth of people exercising their educational intent in the realisation of their educational values is a fact of their lives and my life. The validity of their practices lies in the practices themselves, and is the judge of the quality of the practices. In their accounts of practice, people the world over are offering explanations for what they are doing as they seek to contribute to the education of their own social and cultural formations. The people form a community of educational enquiry, and their collective stories form a strong knowledge base (Snow 2001), that enables practitioners to encourage others to become more than they are. And so I can walk away if necessary and appropriate, and my influence remains. The open societies that people have brought into existence are self-sustaining, a thought that sustains me as I retreat to my garden to think and wonder, to enjoy the moment and prepare for what is to come. This paper amounts to my living professional portfolio. It is not a closed book, in any sense. I have written a text that, although self-contained, is still in progress, much still to be written as the truth of my life unfolds. It will never close as long as I continue enquiring, in the company of amazing people, into the unfolding miracle of my life. I will continue to write my own book of life, within the wider Book of Life, of which my story is one among countless millions, all explaining how we are contributing to the work of the universe, as we respond to one another for our mutual wellbeing. Here is a picture of me, taken in Iceland, in 2007. Bourdieu, P. (1990) The Logic of Practice. Cambridge, Polity. Feynman (2001) The Pleasure of Finding Things Out. London, Penguin. Lather, P. (1991) Getting Smart: Feminism research and pedagogy with/in the postmodern. London, Routledge. McNiff, J. (1984) ‘Action Research: a generative model for in-service support’, British Journal of In-Service Education, 10 (3), Summer. McNiff, J. (1989) ‘ An Explanation for an Individual’s Educational Development through the Dialectic of Action Research.’ Unpublished PhD thesis, University of Bath. McNiff, J. and Naidoo, A. (2007) ‘How do we develop inclusional epistemologies for a new scholarship of democratic educational enquiry?’, in Journal of Education, No. 41: 43–58. Popper, K. (1962) The Open Society and Its Enemies. Vol. 1: Plato. London, Routledge. Roche, M. (2000) How can I improve my practice so as to help my pupils to philosophise? MA thesis, University of the West of England. Roche, M. (2007) Towards a living theory of caring pedagogy: Interrogating my practice to nurture a critical, emancipatory and just community of enquiry. PhD thesis, University of Limerick. Schön, D. (1995) ‘The New Scholarship Requires a New Epistemology’, in Change, November/December 27 (6) pp 27–34. Snow, C. (2001) ‘Knowing what we know: children, teachers, researchers’, Educational Researcher, 30 (7): 3–9. Presidential Address to the American Educational Research Association annual meeting, Seattle. Whitehead, J. (1989) Creating a Living Educational Theory from Questions of the Kind, ‘How do I improve my practice?’, Cambridge Journal of Education, Vol. 19, No. 1: 37–41. Whitehead, J. (2004) ‘What counts as evidence in the self-studies of teacher education practices?’ in J. J. Loughran, M. L. Hamilton, V. K. LaBoskey and T. Russell (eds) International Handbook of Self-Study of Teaching and Teacher Education Practices. Dordrecht; Kluwer Academic Publishers, pp 871 –903. Whitty, G. (2005) Education(al) research and education policy making: is conflict inevitable? Presidential Address to the British Educational Research Association, University of Glamorgan, 17 September. Wood, L. Morar, R. and Mostert, L. (2007) From rhetoric to reality: the role of Living Theory Action Research’, in Education as Change, Volume 11, No. 2: 67–80.